Lynette de Silva, Program Director of the Program in Water Conflict Management and Transformation and the Graduate Certificate, was interviewed by the Institute for Water and Watersheds on her recent publication on The Role of Women in Transboundary Water Dispute Resolution. The book chapter focuses on women’s participation in transboundary water dispute resolution at higher levels of decision making and can be found in Water Security Across the Gender Divide, published in October 2017. Oregon State University's PWCMT has announced that in collaboration with the German-Kazakh University in Kazakhstan, IHE-Delft Institute for Water Education in The Netherlands, the Indian Institute of Technology Guwahati, and the University of Geneva in Switzerland the creation of an international consortium called the Universities Partnerships for Water Cooperation & Diplomacy. The goal of the consortium is to harness the expertise and resources of water resources specialists around the world to help prevent conflict and resolve issues related to the sustainable use of fresh water. Director of the PWCMT and OSU Professor, Dr. Aaron Wolf, joins in on Oregon Public Broadcasting 'Think Out Loud' to discuss his new book The Spirit of Dialogue: Lessons from Faith Traditions in Transforming Conflict. 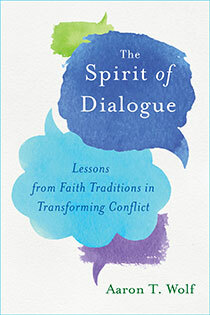 The book The Spirit of Dialogue is available through Island Press. Dr. Todd Jarvis, Director for the Institute for Water and Watersheds, discusses the state of groundwater in Oregon, as part of a follow up piece on the groundwater resources of the state and its governance by the Oregonian. The Texas Tribune interviews OSU Professor and Director of the Program in Water Conflict Management and Transformation, Aaron Wolf, about water conflict management and his role in the field. New research from OSU and collaborators as part of the Transboundary Waters Assessment Programme, funded by GEF, suggests that risks for conflict over water are projected to increase over the next 15 to 30 years in four hotspot regions - the Middle East, central Asia, the Ganges-Brahmaputra-Meghna basin, and the Orange and Limpopo basins in southern Africa. Worldwide, more than 1,400 new dams or water diversion projects are planned or already under construction and many of them are on rivers flowing through multiple nations, fueling the potential for increased water conflict between some countries. New analysis by researchers from OSU, Spain and Chile has been published in the journal Global Environmental Change. Findings cite that the more than 1,400 new dams or water diversion projects are planned or already under construction have the potential to increase water conflict between some countries. Circle of Blue conducted a geopolitical analysis using Aqueduct Water Risk Altas and the Global Conflict Risk Index. It identifies 10 places where water could compound existing social stressors and contribute to a humanitarian crisis.